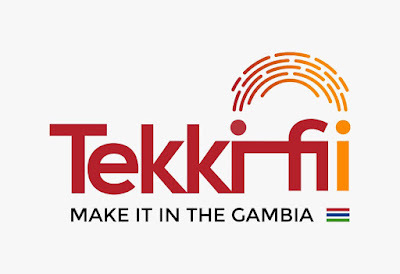 (Banjul) Young people, it’s worth making a living in The Gambia – that’s the message heading to all five regions of the country through a roadshow kicking off under a new Tekki Fii campaign. The roadshow will run from 31 March to 5 April, stopping at different locations to host intergenerational talks, skills orientation sessions on entrepreneurship, solar installation, construction, creative industries, agribusiness and more. The roadshow will conclude with an official launch event of the Tekki Fii campaign and the Gambia Trade Fair International on 7 April, with a keynote address by President Adama Barrow. The goal of the roadshow is to enable young people to see the benefits of choosing to ‘Make It Here’ – or Tekki Fii in Wolof – by tapping economic opportunities in the country rather than going abroad through irregular migration. The government of The Gambia through its National Development Plan (2018-2021) prioritizes youth employment and empowerment and is designed to ‘leave no youth behind’. Through the broader campaign, the government is working with the business community, youth groups and development partners to show young people – especially those most vulnerable to migration – that they can not only survive but thrive in The Gambia, in a variety of sectors, ranging from construction, the arts and agriculture to tech and tourism. The plan is to accomplish this by orienting youth about job-ready skills and entrepreneurship opportunities so that they can earn higher, stable incomes and create jobs for others in their communities. About the Tekki Fii campaign – The campaign aims to inform young Gambians about ongoing support programmes of the government and its partners and to change perceptions regarding irregular migration while showcasing and encouraging them to make it at home. The campaign is sponsored by the ‘Make it in The Gambia – Tekki Fii’ project, an initiative of the Government of The Gambia to significantly scale quality job opportunities available to young Gambians, focusing on the most vulnerable ones. The project is funded by the European Union Trust Fund for Africa (EUTF) and implemented by the International Trade Centre (ITC), German Agency for International Cooperation (GIZ), Instituto Marquês de Valle Flôr (IMVF) and the Belgian Development Agency, Enabel. The project builds on existing EU-funded initiatives such as ITC’s Youth Empowerment Project (YEP) and the European Union-International Organization for Migration (IOM) Joint Initiative for Migrant Protection and Reintegration. The Tekki Fii campaign is coordinated by the Government of The Gambia through the Office of the Vice President and is technically supported by the Youth Empowerment Project (YEP). About the European Union Emergency Trust Fund for Africa (EUTF) – The EUTF supports all aspects of stability and contributes to addressing destabilization, forced displacement and irregular migration in particular by promoting resilience, economic and equal opportunities, security and development, and the improvement and implementation of planned and well-managed migration policies. The EUTF aims at improving living conditions in Africa. It seeks to help people live in a peaceful and stable environment, and to work in dignity. About the International Trade Centre and YEP – The International Trade Centre is the joint agency of the World Trade Organization and the United Nations. The International Trade Centre assists small and medium-sized enterprises in developing and transition economies to become more competitive in global markets, thereby contributing to sustainable economic development the United Nations’ Sustainable Development Goals. The Gambia Youth Empowerment Project (YEP) is funded by the EUTF and addresses the economic root causes of irregular migration. By improving the employability of youth, especially potential and returning migrants, increasing income opportunities along value chains and helping young entrepreneurs to connect to trade and tap into the digital economy, the project contributes to creating jobs and building the long-term growth and economic competitiveness of The Gambia.